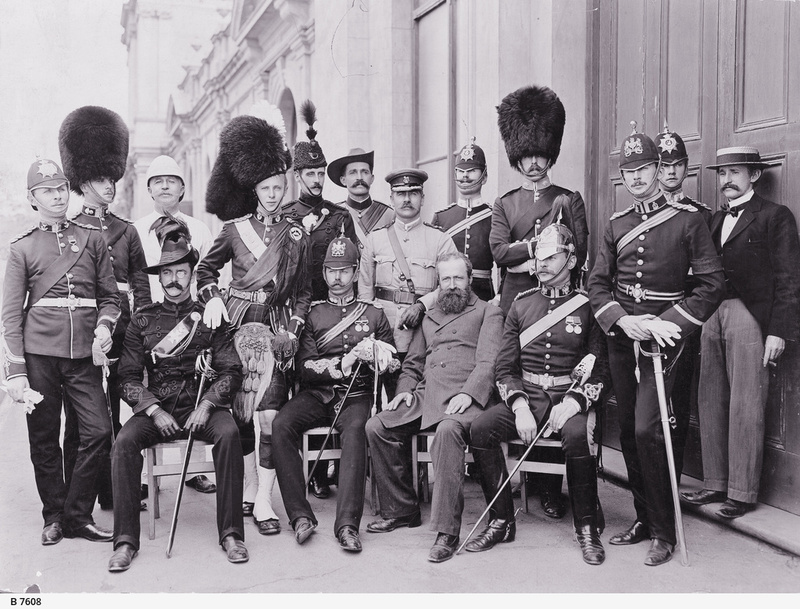 [General description] A colourful group portrait of Imperial army officers showing a variety of dress uniforms. Two high ranking Australian public servants and a reporter are included in the group. [On back of photograph] 'Group of Imperial Army officers visiting South Australia during the visit of the Duke of York / From left to right: Lieut. Chichester; Somerset Light Infantry, Lieut. Chichester; Royal Fusileers, Mr. Owen Smyth; Superintendent of Public Buildings, Lieut. Davies; Middlesex Volunteers, Lieut. Dougall; 79th Cameron Highlanders, Lieut. Bernard; Rifle Brigade, Capt. Powell; Royal Engineer, Mr. Oliphant; South Australian Militia, Lieut.-Colonel Hampson; South Australian Militia, Hon. R.W. Foster; Commissioner for Public Works, Lieut. McLean; Army Service Corps, Lieut. Baring; Coldstream Guards, Lieut. Collins; King's Dragoon Guards, Lieut. Hyde; Royal Army Medical Corps, Lieut. Sutherland; Norfolk Militia, Mr. Calder; Reporter. Presented by Miss M.A. Foster'.